Despite the name, smartwatches can be kind of dumb. Sure, they can do cool things, like control your music and put notifications on your wrist. But battery life woes and underwhelming platforms leave you questioning the real IQ of these supposedly “smart” devices. However, there is a road less traveled: an area unexplored by big tech giants, where people can revel in functioning wristputers without being stuck in a technological mire. They’re called mechanical smartwatches: Transformer-like “more than meets the eye” gadgets that look like normal watches on the outside but pack lots of smarts on the inside. It’s the wrist wearable for those who don’t want another screen shoved in front of their face or another gadget that needs daily charging. Over the past few weeks, I’ve worn every watch a few days (yes, also while sleeping) to get a sense for its tracking and connectivity capabilities. Because many of these watches can go years without needing a new battery, battery life tests were not much of an issue. Some watches offer different features compared to others, but the two guiding principles behind which watches made the cut were 1) they had to have little-to-no digital display whatsoever and 2) they needed to add some kind of additional utility over normal mechanical watches. With those two ideas in mind, I began my search—and it was a fruitful one. Withings Activité lineup covers everything from super affordability to Swiss movement, but it’s the Pop where you really get the most for your money. For $150, you get a good-looking watch with accurate step and sleep tracking as well as a feature-rich and well-design app (a rarity among these types of watches). With a smaller profile than any other watch on this list, the Activité Pop will fit on your wrist no matter your gender. That small footprint also comes in handy if you spend a lot of the day typing on a computer. Besides, a bulky gadget isn’t exactly something you want hanging on the end of your arm when you’re trying to sleep. Although the Pop is the best value, you can spend $20 more and spring for the Activité Steel, which is the same watch with a polished metal frame and a more neutral color palette. If you really want to spend some bucks, you can opt for the “swiss-made” Activité that’s a more elegant time piece, but it also costs $450. Before you make any expensive watch decisions, though, check out the next guy on this list. Swiss watchmakers aren’t standing still while legion of smartwatches pass them by. Some have even placed big bets by creating watches for Google’s Android Wear platform. But Swiss makers like Mondaine are taking a more subtle approach, instead launching a smartwatch with all its tech hidden under its signature Helvetica watchface. At its most basic, you could think of the Helvetica 1 Smartwatch as a hybrid watch/fitness tracker. Throughout the day, it tracks your steps and at night it tracks your sleep. However, you might be reluctant to sweat all over this watch at the gym. It’s got a leather band, which is not always sweat friendly, and it costs $900 (though I have seen elsewhere for much cheaper). The included MotionX app, which acts like a dashboard for your steps and delivers progress in easily digestible charts, also includes a “smart” coach. Although the activity coach does come in handy when it cross-references with your progress, noticing sleepless nights or a dip in activity, it can also misfire. One time it told me to burn calories by shoveling snow… in April. But for a first effort, the Mondaine Helvetica 1 is great for people who want to keep tabs on their daily activity but aren’t necessarily a gym rat training for a marathon. And if Mondaine’s obsession with certain fonts isn’t your thing, the same smart platform is baked into watches from Frederique Constant andAlpina as well. 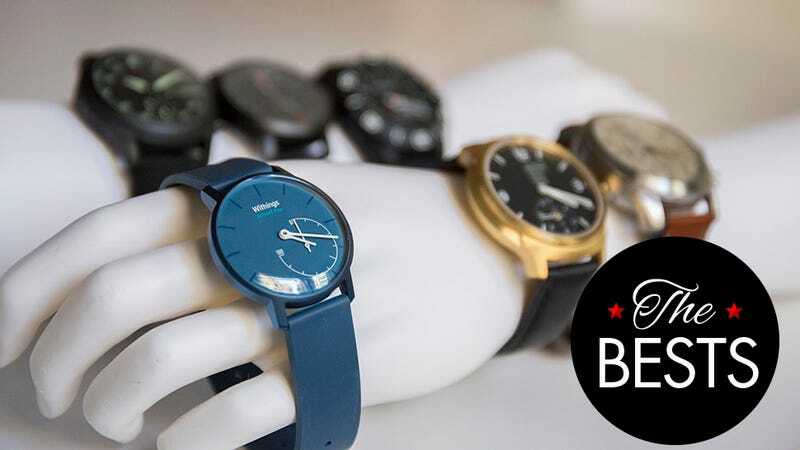 Fossil has been making affordable watches for years, but smartwatches are definitely a new thing for the well-known watchmaker. This year, Fossil released the the Q Founder: a more traditional smartwatch running on Android Wear. But Fossil also built the Q54 Pilot as a “smart” option of its well-known mechanical watches. Unlike the other Bests on this list, the Q54 Pilot doesn’t uses a smartphone connection to maintain accurate time. Instead, it uses a mechanical mechanism. That means it won’t keep time as accurately over time, but it also means that it’s the only true mechanical smartwatch on the list. If you’re unwilling to let go of little, arguably archaic watch details, the Q54 is worth consideration. The other cool thing that separates the Q54 from the pack is the ability to set up vibration-based notifications—two, three, or one long vibration—to tell if you’re getting a call, text, email, or whatever you want. The level of customization is actually surprisingly impressive. After a few days of getting used to the periodic vibrations on my wrist, the Q54 became a great smartphone companion. It’s not all sunshine and roses with this watch, though. The app is well-designed compared to some of the watches languishing in the Rest section, but it also has superfluous features like Q Curiosity, which gives you daily “challenges.” Oddly they’re not fitness goals, but weird things like taking a “picture of something that inspires you.” No thanks. Also, this guy needs weekly charging and the packaged proprietary charger is far from what I’d call sleek. It is, in fact, quite beefy. Nevertheless, the activity tracking is accurate and the added touch notifications is a noticeable distinction from the other smart dumb watches out there. At $175, that ain’t too bad. A good watch with a not-so-good app. I was plagued with some connectivity issues, and because of a recurring update error, my watch just kept failing and never worked for an entire evening. Then it just stopped responding entirely. I’ve reached out to Timex about the issue and will update if I possibly just had a faulty watch. I actually like this watch, but its teeny low-res LED display is so bright (and non-adjustable) it can be kind of distracting and the ticker-style display can make reading notifications annoying without the ability to recall missed messages. The app could also use a little design work. At $250, I’m having a tough time suggesting this over just a good old Pebble or any of our bests smart mechanical watches. This timepiece shows all the signs of a first-gen product from a company known for great running apps and not gadgets with an unappealing and uncomfortable design. The watch case is made of metal and is also really heavy, but the stiff nylon band makes for an incredibly uncomfortable fit. It also doesn’t have automatic sleep tracking, and I almost habitually forgot to hit the button before falling asleep. Of course, since this thing is so damn heavy, wearing it to bed wasn’t very much fun. If you have a Runtastic Premium account, maybe? Even then, for $180 (for the Elite), you’ve got better options. We wanted to try out this guy because it seems cool, and it had a successful Indiegogo campaign! But we were never able to get our hands on one. Other reviews have placed Mondaine and Withings ahead of the pack, and the app look like its leaves much to be desired, but we’ll update if we can get our hands on one. Another great idea, that’s unfortunately not available yet. The pitch is you can add this disc module to any watch and bam—wearable smarts. Hopefully the pitch follows through, and we’ll update once we get the chance to try it out.